Behaviour of geotechnical material is very complex. Most of the theoretical frame work to understand the behaviour of geotechnical materials under different loading conditions depends on the strong background of the basic civil engineering subjects and advanced mathematics. However, it is fact that the complete behaviour of geotechnical material cannot be traced within theoretical framework. Recently, computational models based on Finite Element Method (FEM) are used to understand the behaviour of geotechnical problems. FEM models are quite complex and is of little interest to undergraduate students. A simple computational tool developed using Discrete Element Method (DEM) to simulate the laboratory experiments will be cutting edge research for geotechnical earthquake engineering education. This article summarizes the potential of DEM to simulate the cyclic triaxial behaviour of granular materials under complex loading conditions. It is shown that DEM is capable of simulating the cyclic behavior of granular materials (e.g. undrained, liquefaction and post liquefaction) similar to the laboratory experiments. 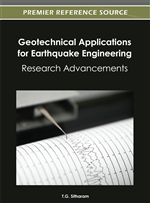 Geotechnical Earthquake Engineering is a branch of civil engineering which deals with soil, rock and underground water and their relation to the design, construction and operation of engineering projects during dynamic loading. Sound knowledge in engineering mechanics, mechanics of solids, vibrations and fluid mechanics is a pre- requisite to this branch of civil engineering. However, the behaviour of geotechnical material is often complex and theoretical background developed with the aid of advanced mathematics is not sufficient to understand its true nature. In addition, most of the students have difficulty in bridging the results of the laboratory experiments to the theoretical component. Many students would not grasp the underlying mechanics involved in the different laboratory experiments. This may be partially due to the fact that the students during the lectures learn theories and methods for the design, while the lab testing focuses on studying the response of small elements or samples. In the recent past, several researches have been carried out to improve the geotechnical engineering education through educational websites and internet based virtual labs (Budhu, 2002, Arduino et al. 2002, Elgamal et al. 2005). Such learning environment greatly facilitates the (1) efficient use of time and resources, (2) flexibility in accessing information, and (3) convenience of self-paced learning with the aid of physical models (Soh and Gupta 2000). Nowadays, computational modeling using Finite Element Method (FEM) is widely adopted to understand the behaviour of complex geotechnical problems. For undergraduate program this FEM modeling is of little interest due to the complexity of common computational models that make use of the Finite Element Method. In addition, these students usually lack the background that is required to implement such methods. A viable solution is to introduce relatively simpler numerical tool such as Discrete Element Method (DEM) to simulate the basic laboratory experiments. DEM models the soil as a collection of discrete particles (Figure 1) rather than continuum (Sitharam et al., 2005). Moreover, DEM model treats individual particles separately and the particle movements are captured by Newton’s second laws motion. The contact force developed between the particles is computed using simple spring, dashpot model. The advantage of using DEM-based models is that the underlying physics are clearly resolved and the models are inherently discontinuous and heterogeneous (EL Shamy, 2006). Recently, DEM has been implemented in education at the graduate level (You, 2005) and has emerged as a powerful illustrative tool (Lobo-Guerrero and Vallejo 2006). This article highlights the potential of DEM to simulate the cyclic triaxial test, one of the most widely used equipment in geotechnical earthquake engineering.